SFL900C is a high performance, high power factor flyback PWM controller special for LED lighting applications. The IC adopts unique super-PFC/PSRTM which can support both PSR and SSR applications. 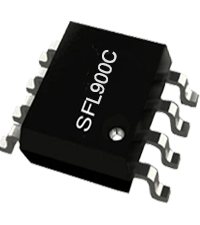 SFL900C is pin compatible with mainstream PFC controllers such as XX6561/6562, XX7527, etc. SFL900B also integrates proprietary min-THDTM, technique, which can achieve less than 10% THD for universal line input. SFL900C has built-in Load CC Compensation and AC Line CC Compensation function, which can further increase LED output CC accuracy. The IC has Max. 90KHz Frequency Clamping function and soft totem pole Gate driver to improve system conduction and radiation EMI. The IC will Clear External EA Feedback Network before IC power on, which can reduces startup LED current spike. The IC also has Soft Start control during power on period. In SFL900C, the proprietary "Frequency Adjusting" can help to improve THD performance, while ensures audio noise free operation. SFL900X integrates functions and protections of Under Voltage Lockout (UVLO), LED Open/Short Protection, VCC Over Voltage Protection (OVP), Load Over Voltage Protection (Load OVP), Soft Start, Cycle-by-cycle Current Limiting (OCP), Burst Mode Control @ Light Loading, GD Clamping, VCC Clamping, etc. SFL900C is available in SOP-8 and DIP-8 packages.